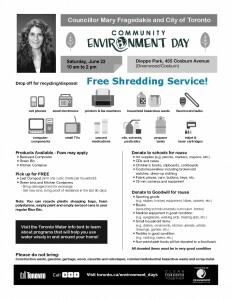 Ward 29 Bikes will be at the annual Ward 29 Environment Day hosted by Councillor Mary Fragedakis this Saturday, June 22 at Dieppe Park, 10 a.m. – 2 p.m. We’ll be handing out new 2013 City of Toronto cycling maps and CAN-BIKE schedules, as well as sharing information about cycling projects around our neighbourhood, commuting and recreational routes around the city, and cycle tourism throughout Ontario. Drop by our table on Saturday and say Hi. And of course, Environment Day isn’t just about us; you’ll also be able to drop off your household hazardous waste, pick up as much compost as you can carry, donate clothing, household goods, and school supplies for reuse, and—new this year—bring old documents for secure shredding. Check out the full-size flyer for more information. The Ward 29 Bikes information table at the local Community Environment Day a couple of Saturdays ago was quite popular, sandwiched as it was between the free compost and discount green bins. We spoke with dozens of cyclists, including three candidates for Ward 29 councillor in the upcoming municipal election, mayoral hopeful George Smitherman (above), and retiring councillor Case Ootes. The biggest concern among the people who visited our table was safety: they wanted safe, convenient, and well-maintained cycling routes throughout Ward 29, whether for going downtown for work, to the Danforth for shopping, or to local destinations like schools, parks, and libraries. We helped many cyclists identify safer recreational and commuting routes, while taking recommendations about what infrastructure was most important. No surprise there: practical bike lanes led the charge. But we also heard a lot about the need for more bike parking at shopping destinations like the Danforth, and about the sorry state of maintenance on many common cycling routes. Coming up this summer, we’ll be producing an audit of these very concerns. Stay tuned. And a thanks to retiring Ward 29 councillor Case Ootes (above) and his executive assistant Sunny Petrujkic for helping to arrange our presence at this year’s Community Environment Day. We look forward to working with Ward 29’s new councillor at next year’s event. Thanks to Ward 29 Bikes member Kathy Chung for the bottom three pictures. Ward 29 Bikes is going to be at the Ward 29 Community Environment Day this Saturday, May 1. Drop by our table for the latest updates on cycling in and around our neighbourhood. But meeting us isn’t the only attraction; you can also drop off household hazardous waste, donate various items for reuse, and pick up free compost. The City of Toronto’s web site has a full list of items you can bring, buy, or take home. Environment Day runs at Dieppe Park (enter from Cosburn Avenue just east of Greenwood Avenue) from 10 a.m. through 2 p.m. on Saturday, May 1. Councillor Case Ootes is hosting the 2009 edition of the Ward 29 Community Environment Day at Dieppe Park this Saturday, April 18. This is your opportunity to donate some small household items, get rid of household hazardous waste (including old paint, batteries, and inkjet cartridges), pick up compost for your garden, and bring home water efficiency kits or rain barrels. The City’s website has the full list of items you can drop off, buy, and pick up for free. Automobile traffic at the event is frequently backed up along Cosburn Avenue, and all of those idling cars seem to run against the very spirit of an Environment Day. So why not take your bike? The Cosburn bike lane that stretches across the entire ward will take you safely right to the Dieppe Park entrance. Once in, be sure to stop at the fundraising BBQ and say hi to Councillor Ootes.